A fraudster who plundered £64,000 from the charity Oxfam attempted to use the Press Complaints Commission to stop a regional daily covering the case. Edward McKenzie-Green, who had been head of counter-fraud at the charity, pleaded guilty to fraud at the Old Bailey yesterday after creating false invoices for companies he had set up. After the case, the Oxford Mail revealed that McKenzie-Green, of The Leys, Chipping Norton, had attempted to “cow” the paper into dropping its coverage of the case by threatening libel action as well as a complaint to the PCC. However the Newsquest-owned title said yesterday’s admission of guilt showed it had been right to stand its ground. The saga began last June when the paper ran agency court copy which incorrectly stated that McKenzie was on conditional rather than unconditional bail. Although the error was swiftly corrected in the online version of the story, McKenzie-Green filed a complaint to the PCC under Clause 1 of the Editor’s Code, which covers accuracy, and also under Clause 3 covering privacy, claiming the paper had invaded this by publishing his name and address. 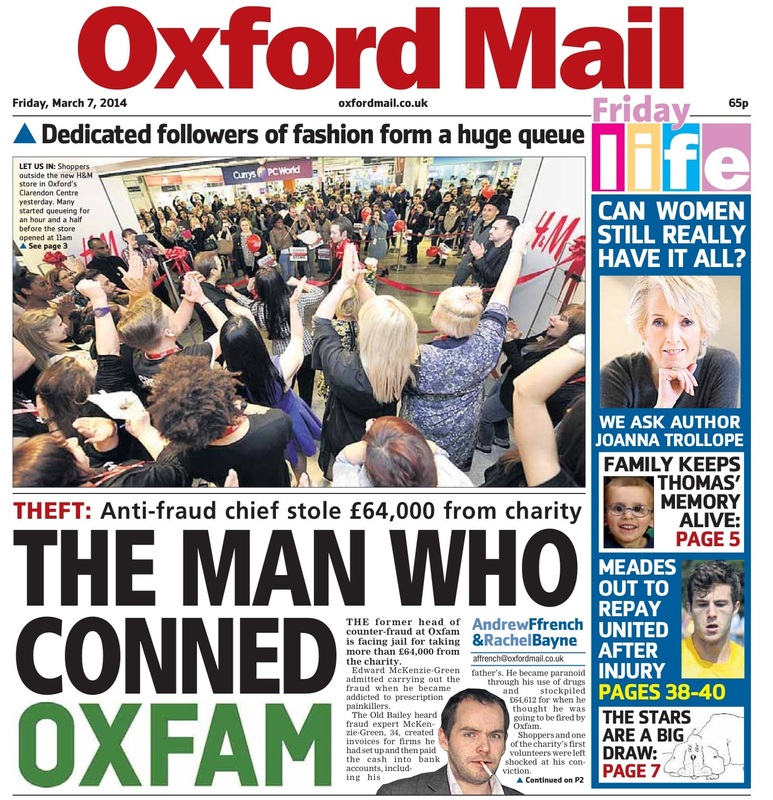 In his complaint, he said he did not want an apology published, and claimed the paper was working with Oxford-based Oxfam to try to bring his name into disrepute. Eventually the PCC found in his favour on clause 1 but that the paper’s immediate action in changing the online story was sufficient. It threw out all of his other complaints. Assistant editor Jason Collie said: “Edward McKenzie-Green was clearly attempting to use the Press Complaints Commission and threats of libel to cow our perfectly legitimate coverage of the proceedings as they went through court. “His complaint was based on some wild claims, including that we were trying to blacken his name to help Oxfam and that we had obtained leaked information. “The fact he didn’t even want a correction published on the minor mistake from the agency over his bail status leads us to believe this was all about trying to keep his name out of the press. “We said we would not be intimidated from covering a prosecution that was entirely in the public interest to cover. “It involved a large amount of money being swindled from a charity that is supported by donations from the public. His barrister Matthew Sherrat told the court that the offences occurred after his client developed “a very serious addiction” to prescription drugs and suffered a breakdown. The only thing stopping corruption in the UK reaching Russian, Nigerian and Pakistani standards (as per relevant reports by Transparency International and the UN) is this country’s proud tradition of a free press, and the bravery of the young men and women with a conscience who risk all to reveal the truth. Three cheers for the brave reporters at the Oxford Mail and all the other regional papers that risk all to tell the truth. And three cheers to HTFP for alerting us all to their bravery. I can’t help feel sorry for the poor cow. It sounds like he attempted to herd it into the regional daily’s office, perhaps in retaliation for their alleged muck-spreading?